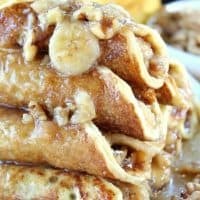 Hey pancake lovers, if you love pancakes and have sweet tooth cravings, you are going to want check these out. 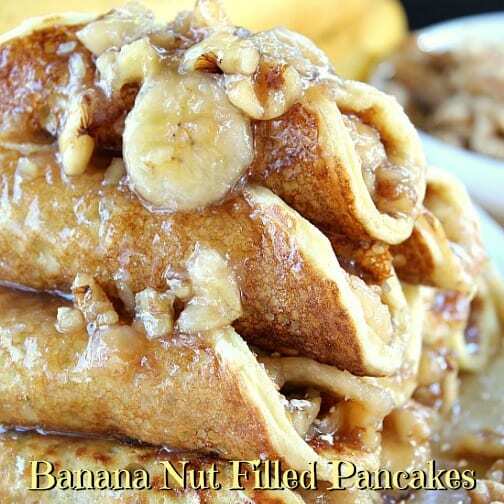 Banana nut filled pancakes are what’s for breakfast at our house. 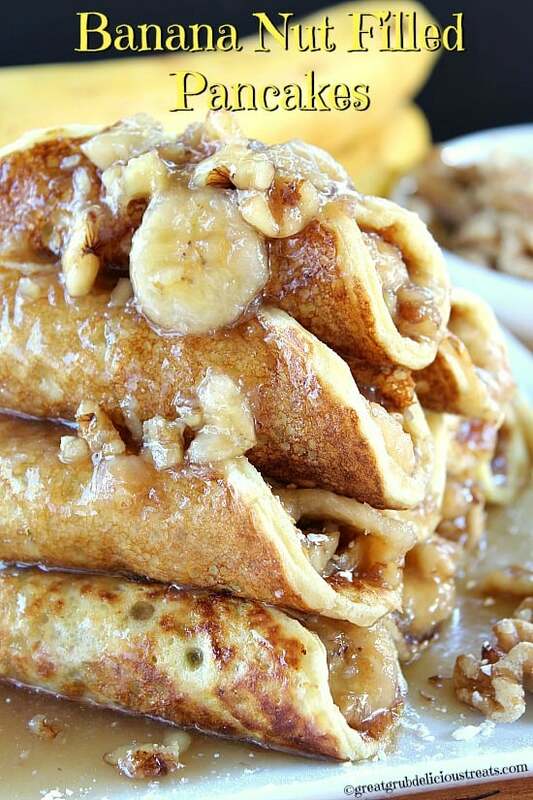 Each pancake is filled with a delicious banana nut maple syrup filling, which tastes freakin’ amazing! 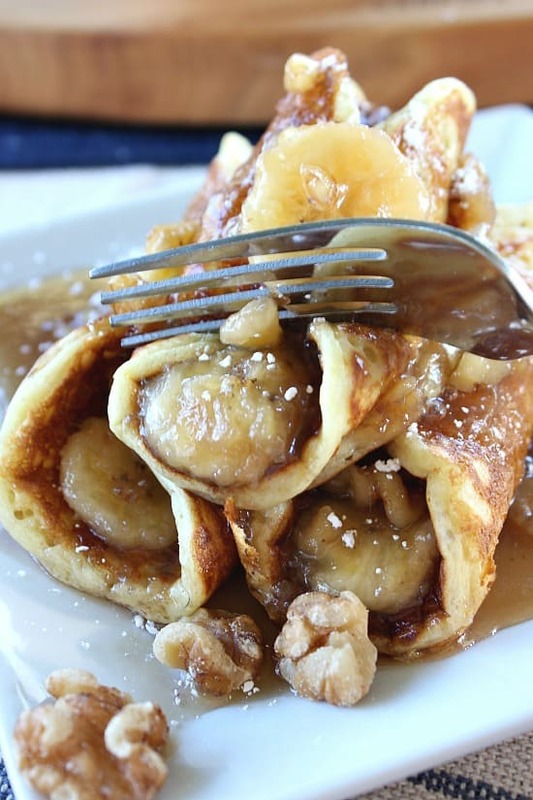 The thin pancakes worked out perfectly for these banana nut filled pancakes. I received this buttermilk pancake recipe from a very wonderful lady I met a couple weeks ago, who I spoke about in my post for Crock Pot Cheesy Chicken. Thank you Anne! When I made her buttermilk pancakes, they reminded my brother and I of our late Grandma Anne’s buttermilk pancakes, thin and delicious. Anyway, I wanted to make them again, but this time I decided I would add some bananas and nuts along with some delicious maple syrup. In a medium saucepan, melt 4 tbs butter over medium heat. Once melted, throw in the chopped walnuts. Let cook for a minute or so and then add the sliced bananas, stir. Pour the maple syrup into the pan and turn heat to low. Cook on low for a few minutes until hot. 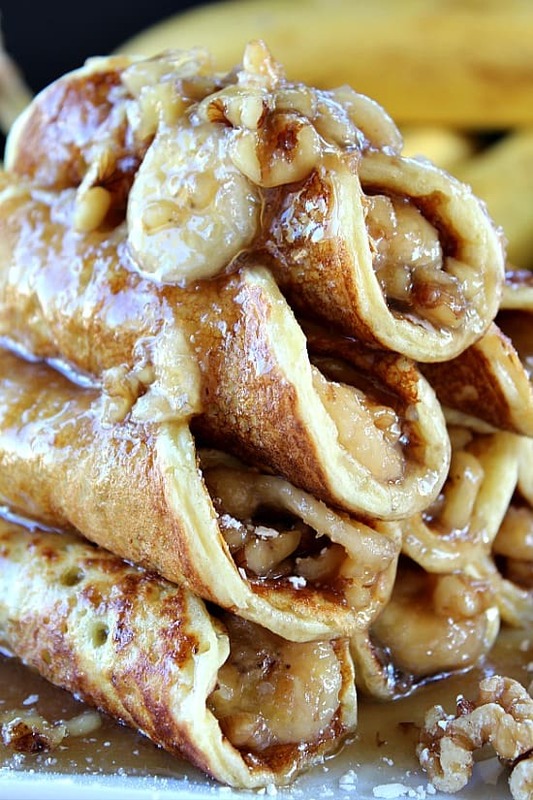 Remove from heat and cover until pancakes are cooked to keep warm. 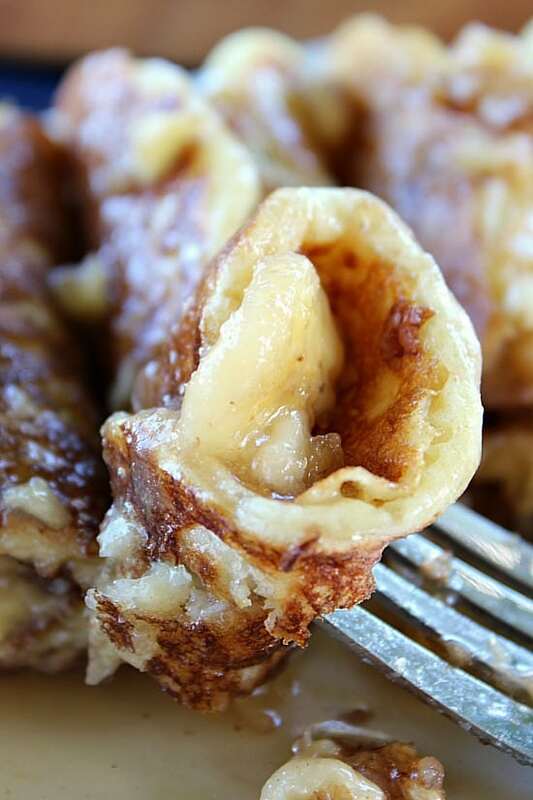 Once you have all the pancakes cooked, add a tablespoon of banana nut mixture, roll up and secure with a tooth pick until ready to serve. Repeat until all pancakes have been rolled up. When ready to serve, remove tooth picks, spoon additional banana mixture on top and sprinkle with powered sugar. Enjoy! This is definitely not for any one who has to watch their sugar intake. Seriously, absolutely delicious and super sweet. Just the way I like it! 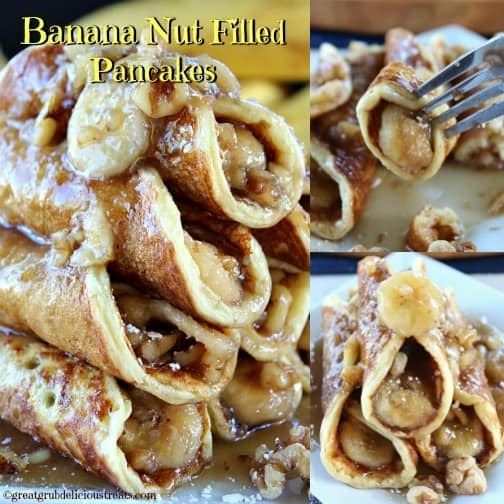 So, if you are wanting to have a delicious, sweet breakfast treat, then these banana nut filled pancakes are just what you need. Preheat an electric griddle to 375°. In a medium mixing bowl, whisk flour, sugar, salt, baking powder, baking soda together. Set aside. In another medium mixing bowl, beat eggs. Add buttermilk and butter. Pour wet ingredients into dry ingredients. Stir until just combined. Batter will be lumpy. Pour 1/4 - 1/3 cup of batter for each pancake on preheated buttered griddle. Let cook approximately 2 minutes per side. 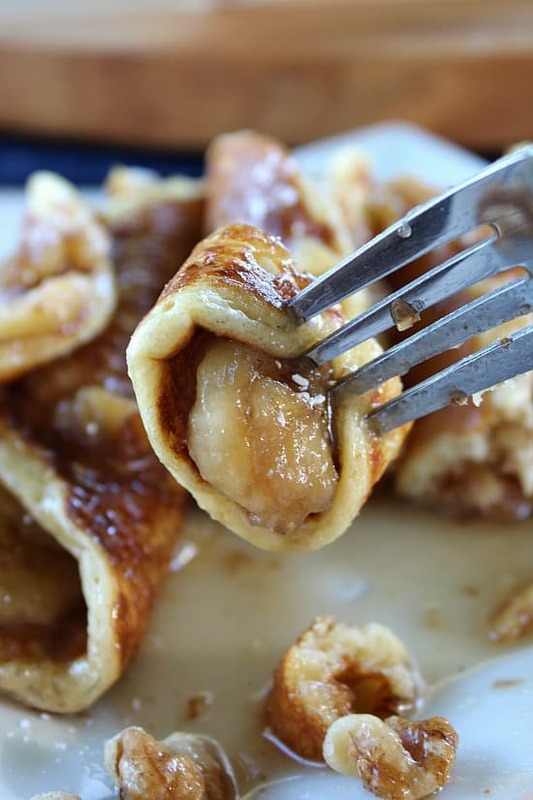 Remove from griddle and place on a plate until ready to fill with banana mixture. 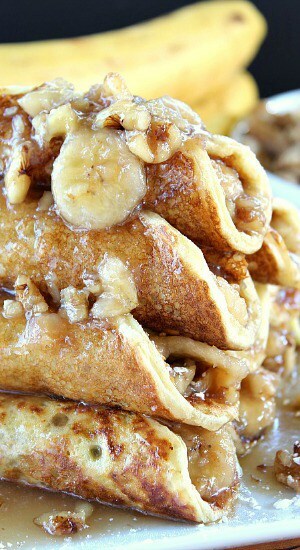 Once pancakes are cooked, add a spoonful of banana nut mixture, roll up and secure with a tooth pick. 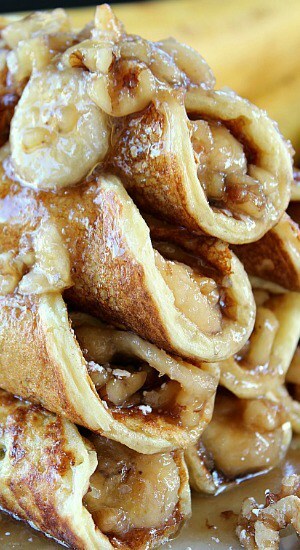 Repeat until all pancakes have been filled and rolled. When ready to serve, remove tooth picks, spoon additional banana nut maple syrup on top and sprinkle with powered sugar. Buttermilk Pancake recipe adapted from my friend Anne. Looks yummy. This is something I will surprise my hubby with!